The Pitt men’s basketball team received its first verbal commitment of the 2018-2019 recruiting season today at noon when four-star recruit Trey McGowens announced his commitment to the Panthers via Twitter. McGowens, a senior 6-foot-3 guard at Hargrave Military Academy in Chatham, Va., chose Pitt from a field of other finalist schools that included Clemson University, University of Minnesota, University of Mississippi and St. John’s University. He chose to forego his planned postgraduate year at Hargrave and will graduate in the class of 2018 instead, meaning he will play the 2018-2019 season at Pitt as a first-year. 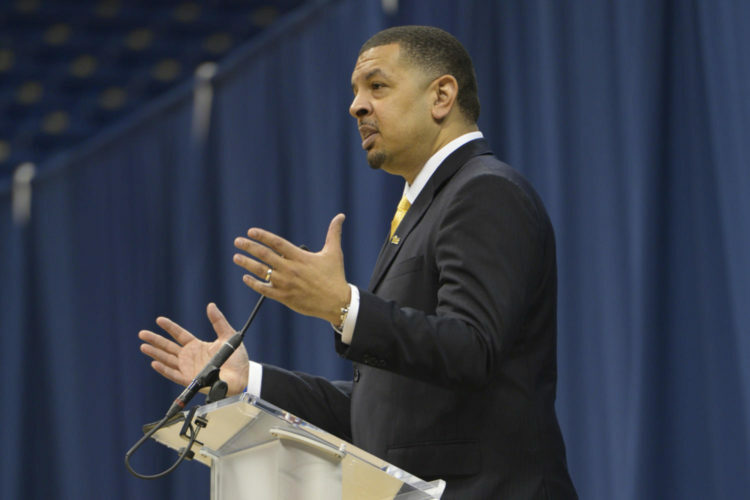 The addition of this star recruit is the first major accomplishment for new head coach Jeff Capel, whose reputation as a top-notch recruiter dates back to his time under Coach Krzyzewski at Duke. According to 247Sports.com, McGowens is the 88th-rated recruit in the class of 2019, making him the first top-100 player to commit to Pitt since Michael Young in 2013. With the commitment, McGowen is set to fill the Panthers’ most needed position — a ball-handling guard. With first-year guards Marcus Carr and Parker Stewart both transferring, first-year Khameron Davis and junior Jared Wilson-Frame were set to be Capel’s only two returning guards. Next on the recruiting trail, Capel will likely look to address the Panthers’ lack of height, as first-year Terrell Brown is the only returning player taller than 6-foot-6 who saw consistent court time last season.